Nathaniel Hawthorne was born in a house at 27 Union St. in Salem, Massachusetts, in 1804 and lived in Salem on and off during his life. He left Salem in 1821 to attend Bowdoin College and returned in 1825 to live at 10 ½ (or 12) Herbert St. in the house he referred to as "Castle Dismal." From 1828-1832 he lived at 26 Dearborn St. with his mother and sisters in a cottage built for his mother by her brother, Robert Manning, who lived in the house next door at 33 Dearborn St. In 1831 and 1832, Hawthorne travelled to the Shaker Community in Canterbury, NH, to the Erie Canal, and to Niagara Falls. In 1832 Hawthorne and his family returned to the Herbert St. house. 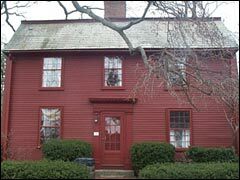 In January of 1836 Hawthorne moved to Boston but returned to the Herbert St. house in Salem in August of that year. In the following summer he spent five weeks in Maine, but he returned to Salem, and in November of 1837 he met his wife, Sophia Peabody, at her home in Salem. In 1839 Hawthorne lived in Boston while working at the Boston Custom House, and in April of 1841, he moved to Brook Farm in West Roxbury where he lived until November of that year. After his wedding in Boston on July 9, 1842, he and Sophia moved into the Old Manse in Concord which they rented from Ralph Waldo Emerson. Because they were no longer able to afford the rent on the Concord house, on October 2, 1845, Hawthorne, Sophia, and their daughter, Una, born in 1844, returned to Salem where they lived in Hawthorne's mother's home on Herbert St.
On April 9, 1846, Hawthorne was sworn in as surveyor in the Salem Custom House. In March of that year Sophia moved to 77 Carver St. in Boston as she was pregnant again and wanted to be near her family and her doctor. Hawthorne soon joined her and commuted to his job at the Salem Custom House. Shortly after the birth of their son, Julian, in June, the family moved back to Salem into a house at 18 Chestnut St. but moved again only a couple of months later into a house at 14 Mall St. which was large enough to allow his mother to live with them. This was the last house in Salem in which Hawthorne lived. In May of 1850, Hawthorne and his family left Salem and moved to a cottage in Lenox, MA.